This huipil (pronounced "we-peel") is new and was woven in the town of San Andrés Larrainzar, Chiapas, Mexico. Each of the many villages in highland Chiapas has a distinctive style of weaving and clothing. This type of blouse is made and worn only by women in the village of San Andrés Larrainzar. The yoke and sleeve brocade of this blouse were woven on a backstrap loom. Once woven, the brocade was cut and machine sewn onto white synthetic fabric bought for the blouse body. Many anthropologists believe that Mayan women have been weaving on the backstrap loom for thousands years. It is an ancient art that is as alive and vibrant today as are the people themselves. Today weavers use the backstrap loom to create clothing for their families, as well as textiles to sell to other Chiapanecos and tourists, which for many families is their only source of reliable income. "A backstrap loom is a flexible web. Warps that stretch [from a woman's waist strap] are held by rods tied at one end to a tree; the weaver can adjust the tension of the loom by leaning forward or back. The width of the warps tied to the rod sets the width of the finished cloth... To weave a single line of cloth a weaver places a wooden batten, shaped like a thick, dull sword with blunt points on both ends, between the sets of warps, called sheds. The even numbered warps from one shed and the odd warps the other. The batten is twisted on its side to form a narrow space between the sheds through which a shuttle, a thin rod wrapped with thread, is passed, leaving behind the line of thread called the weft. To reverse the sheds for the next line a weaver uses a heddle, a rod that holds a string that loops under each odd warp. She leans forward and lifts up the heddle rod; all the odd warps are pulled up by the looped string of the heddle, but the even-warp shed stays in place. Again the batten is inserted in the space between the sheds to make room for the shuttle. Once the weft is in place it is pounded into a straight line with the batten." A = A cord or rope is used to tie the loom to a tree or post. B = End bars are used to hold the warp (vertical threads) the the upper and lower ends of the loom. C and D = Shed rods maintain the crossing of the warp's threads. E = The heddle rod lifts alternate threads of the warp. F = The batten helps to separate alternate threads of the warp to allow the bobbin (G) to pass through them. The batten can also be used to tigher the weft (horizontal threads) as they are woven. G = The bobbin, containing the thread of the weft, passes from side to side between the warp. H = This belt is warn around the weaver's back and connects her to the loom. The weaver controls the tension on the warp by leaning backward or forward. Image and label text from Backstrap Looms, (from M. B. Schevill, ed., The Mayan Textile Tradition, 1997). Weaving in Chiapas is exclusively a woman's activity. Through the act of weaving, Maya women continually express and thus actively work to retain their womanhood, ethnicity, world-view and collective identity. As they have for thousands of years, mothers, grandmothers, aunts and older sisters teach girls and young women to weave. Although the women in this area have such an ancient heritage of weaving, this form of expression is by no means stagnant; rather it is in constant motion and change. 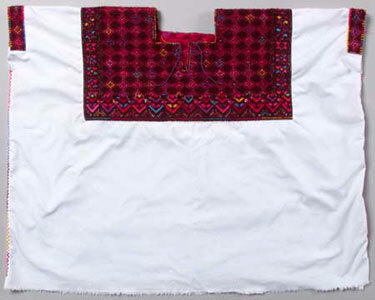 Katherine A. Nelson, the 2002 - 2003 Cordry Intern who collected and researched this blouse (as well as the 24 other blouses in this collection) recently conducted fieldwork in Chiapas. She established relationships with many weavers, young and old, and learned firsthand of many of these changes. In San Andrés, Nelson studied changes in style, manufacturing and marketing of huipiles. She learned that 40 and 50 years ago women most often learned to weave as teenagers. They wanted to be able to make clothing for their family and, if they excelled, to weave the ceremonial huipiles that dress the community's statues of the saints. Many of the younger women Nelson spoke with, however, explained that they began learning to weave as young as seven or eight years of age. The youngest women wanted to learn to weave to be able to create textiles (such as traditional blouses, pillow cases, tapestries, towels, etc.) to sell to tourists in order to supplement family income. Being able to weave their own blouses was an added bonus instead of their primary motivation for learning. Nelson also learned that the colors and styles of huipiles woven in San Andrés have undergone change in the past 30 years. The vast majority of the San Andrés huipiles in the Science Museum of Minnesota's permanent collection were collected in the 1970's and 80's. These recent acquisitions differ in color and design. Many of the huipiles woven today in San Andrés have more abstract and stylized geometric designs than the more traditional designs woven even five or 10 years ago. The most dominant color used in the woven yoke of all San Andrés blouses is red. However, there are several different hues of red commonly seen. Through the years color choice has evolved from an orange-red, to a true-red, to a dark-red. More recently, maroon has become the most fashionable color. If you take a careful look at this Object of the Month (at right, top) you will notice that the dominant brocade color is maroon, as it was recently completed. The weaver of this blouse (who wished not to be identified by name) took creative liberties when designing the brocade for the blouse. The end result is this magnificent huipil which appears to differ greatly from a more "traditional" brocade design (at right, bottom), yet it still incorporates many of the design elements that identify a blouse as originating from the village of San Andrés Larrainzar. This blouse is a beautiful example of change in huipil design and color and a fascinating piece to study and have in our collection at the Science Museum of Minnesota. For more information on the Cordry Internship please contact Jim Weil. For more information on this blouse please contact Katherine A. Nelson. Please note: the terms "blouse" and "huipil" have been used interchangeably in this text. Traditionally a blouse was defined as a smaller single panel brocaded garment worn underneath the larger three panel brocaded huipil. Today, however, the distinction has lessened between these terms and both are called ku'il in Tzotzil (the native language of the people of highland Chiapas). Today most women wear blouses (with brocaded yokes and synthetic body fabric) on a daily basis and only wear (completely woven) huipiles on special occasions and for ceremonies.